Apple has a lot of environmentally friendly initiatives, like using renewable energy to power its facilities and encouraging suppliers to do the same. Now the Cupertino firm is adding to its green repertoire by investing in a joint venture that produces aluminum without the greenhouse gas emissions. Given that the company uses a lot of aluminum in its products – from MacBooks to iPhones to iPads – this investment will go a long way in reducing Apple's carbon footprint. 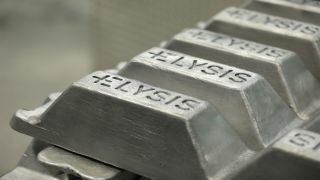 Along with the Canadian government, Apple has invested a combined $144 million in Elysis, a startup set up by mining giants Rio Tinto and Alcoa, the two companies to actually discover the new production technique. Elysis will produce and distribute the technology, which has been touted as the most significant innovation in the mining industry in 130 years. Smelting aluminum – the process of extracting the metal from its oxide ore – requires huge amounts of carbon to conduct electricity and break down the aluminum oxide, releasing carbon dioxide and harmful fluorinated gases into the atmosphere. That accounts for about 20% of the metal’s carbon footprint, with another 55% coming from the electricity needed to power the smelter and the rest of the process. The entire process of producing aluminum accounts for 1% of the world’s total greenhouse gas emissions. "Apple is committed to advancing technologies that are good for the planet and help protect it for generations to come," Tim Cook said in a statement. "We are proud to be part of this ambitious new project, and look forward to one day being able to use aluminum produced without direct greenhouse gas emissions in the manufacturing of our products." Not only will the new smelting process be good for the health of the planet, it also reduces operating costs by 15%, while increasing production by about the same amount. Could this mean that, in future, Apple's products won't cost us the earth (literally and figuratively)? Apple says the technology from Elysis is expected to enter the market by 2024.